Make the most of a small bedroom or limited closet space with the two drawers provided in this bed’s footboard. Perfect for housing additional bedding or folded clothes, these drawers prove an excellent alternative to a bulky chest that takes up precious floor space in your bedroom. 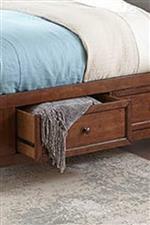 Keep your bedroom organized and free of clutter by utilizing these space-saving footboard storage drawers. This transitional queen bed is the perfect addition for anyone looking to add a bit of style to their room while saving space. Perfect for smaller spaces, this bed features storage drawers on each side to store your clothing and blankets. 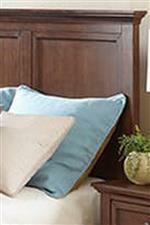 The mantle headboard features panel molding that carries through the footboard for an embellished yet refined look. The Tolson Transitional Queen Storage Bed with Six Drawers at Walker's Furniture in the Spokane, Kennewick, Tri-Cities, Wenatchee, Coeur D’Alene, Yakima, Walla Walla, Umatilla, Moses Lake area. Product availability may vary. Contact us for the most current availability on this product. SM-BR-8865Q-TUS-HB Queen Panel Headboard 1 68" 3" 58"
SM-BR-8865QS-TUS-RS Queen Side Storage Bed Rails 2 82"
SM-BR-8865Q-TUS-FB Queen Panel Footboard 1 64" 3" 18.625"
Case Construction Items are crafted from wood solids and veneers. The wood used in the manufacturing process is kiln dried to achieve the ideal moisture content. Warranty Intercon warrants the construction and workmanship of this furniture product to be free from defects in workmanship for 1 year, under normal household use and service, following date of purchase and delivery to the original customer. This collection blends traditional and contemporary style to capture a beautiful transitional look. Offering a variety of storage pieces allows you to mix and match your own set to create the perfect bedroom group for your space. Each piece is covered in a Tuscan brown or Rustic White finish complemented by aged bronze hardware for a rich, warm feel. If you're looking for sophisticated furniture with a hint of contemporary charm, this is the perfect collection for you. The Tolson collection is a great option if you are looking for Transitional furniture in the Spokane, Kennewick, Tri-Cities, Wenatchee, Coeur D’Alene, Yakima, Walla Walla, Umatilla, Moses Lake area. Browse other items in the Tolson collection from Walker's Furniture in the Spokane, Kennewick, Tri-Cities, Wenatchee, Coeur D’Alene, Yakima, Walla Walla, Umatilla, Moses Lake area.